Why do some malicious people thrive? Why do kind people struggle? If there’s a God, why does he allow evil to flourish? Why doesn’t he act as a cosmic law enforcement officer and intervene in the numerous heartbreaking scenarios on Earth at this moment? Some people even question the existence of a loving god because their own lives have been full of darkness. After all, there’s no way an all-powerful divine being would allow evil to run rampant among his children, right? I don’t expect everyone to agree with me. But, I think those two words are the simplest answer to all of the world’s problems. You may find my reasoning simplistic. However, the concept and consequences of free choice are profound. Free will is the ability to choose between different possible courses of action. 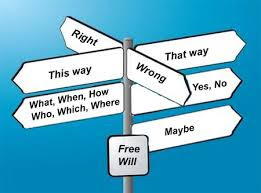 It is closely linked to the concepts of responsibility, praise, guilt, sin, and other judgments which apply only to actions that are freely chosen. The above definition highlights the unexpected depth of the concept. We don’t make any choice in isolation. We must always accept the complicated effects of that decision. Let’s consider the process of parenting on Earth...I’m a mother. In no way did I give birth to yes-men. I have two children who wrote the book on stubborn. No exaggeration. They make wise choices and poor choices daily. I am not running a dictatorship. I allow my children to make decisions in certain situations because I love them. However, they are not able to choose the consequences of those decisions. They do make some choices that lead to unhappiness and poor health. 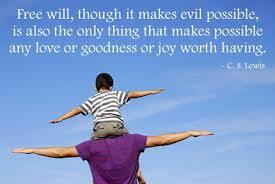 My children’s free will is sacred. I must not tamper with it. They will leave my house eventually. At that point, I will be even less able to monitor and control their actions. As a reasonable parent, I won’t expect to contact them daily in order to ask if they’re treating people right, eating healthy, and so forth. Let’s superimpose the characteristics of earthly parents onto God. He allows all of us the freedom to choose. He is not a heavenly law enforcement officer. Yes, he could stop evil. However, that would be counterproductive to our growth. It’s the same concept behind why we don’t intervene in every aspect of our adult children’s lives. 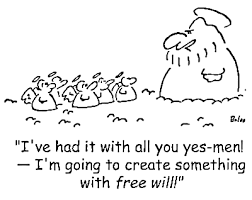 Such a hands-off attitude seems unfair when malicious and misguided people exercise their free will on the innocent. Indeed, life isn’t fair. The good news is that everyone will eventually harvest the consequences of their decisions, good or bad. It’s a scientific fact: you reap what you sow—given time. In this life, we must take the good with the bad. Every individual chooses many actions daily, but none of us can choose the consequences of those actions. What good choices have you made lately?